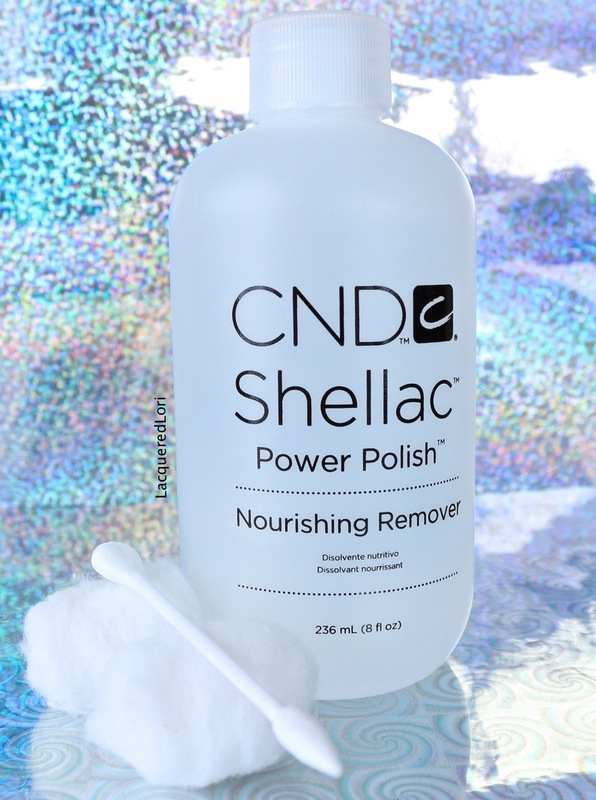 It has been awhile since I reviewed one of my favorite polish removers, CND® Shellac Power Polish Nourishing Remover. I am still using it and I have to say, it’s still my go-to remover when I am in swatchfest mode. Especially with glitters and ornery polishes. That can be anything from 4-12 polishes in one day for my blog! You see, nail bloggers put their nails, hands and cuticles through a lot. Not so much just wearing the polish, no biggie. But removing, washing, re-applying, etc., takes its toll on our very valuable digits. For this you need plenty of TLC including cuticle balms, oils, soaks, nail treatments and good quality removers, top and vase coats. Tools of the trade as it were! 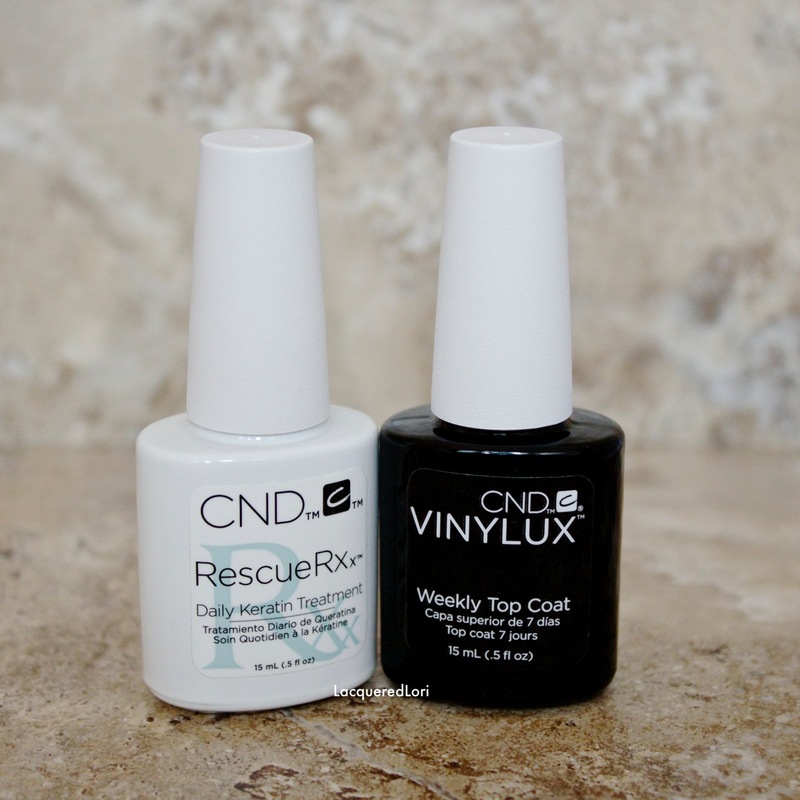 So today I just want to remind my readers that I’m still in love with CND’s remover, and add to that a wonderful daily treatment (not a lacquer), CND® RESCUERXX™ Daily Keratin Treatment. And for the weekly polish system, the VINYLUX® Weekly Polish is a two-part weekly polish system that includes a self-adhering Color Coat which eliminates the need for a Top Coat and an innovative new Top Coat utilizing ProLight Technology™. I have loved my “in-between” swatchathons because I get to pamper my nails and cuticles with oils and healing treatments. I have a bevy of beauty products not only because I tend to not pamper myself enough, but it’s just downright essential. CND® RESCUERXX™ Daily Keratin Treatment is a multi-nourishing and healing fix. Weakened or damaged nails? CND to the rescue! The global leader in professional nail care and maker of CND® SHELLAC® brand 14+ day nail color brings you the next revolution in nail repair with CND® RESCUERXX™ Daily Keratin Treatment. CND® Vinylux Weekly Top Coat for the Weekly polish system is a part of a breakthrough system for fashion perfection…without a base coat! While ordinary polishes break down over time, Vinylux Weekly Polish actually becomes more durable! Use only with Vinylux Weekly Polish. Vinylux Weekly Top Coat becomes more durable with exposure to natural light, dries quickly, and provides week-long wear. According to CND Co-founder and Style Director Jan Arnold, (quote from CND.com news release) “At CND, we are all about maintaining the health of the natural nail,”. “We’re excited to introduce this highly effective new treatment with jojoba oil and keratin proteins. These proteins bond to the natural nail to strengthen while restoring moisture. With continued use, RESCUERXX™ dramatically reduces peeling and white spots for healthier, more beautiful nails!” Read more here! • There are approximately 160 applications per .5 oz. bottle. • RESCUERXX™ with jojoba and sweet almond oil, deposits keratin to weakened, damaged nails to help restore strength and moisture. • Before applying, we recommend you shake the bottle well. For best results, apply to bare natural nails twice daily, massaging into the entire nail, nail edge and cuticle. Use up to four weeks for optimal results. • Do you use Solaroil™ by CND? Awesome! I do too. SOLAROIL™ is a maintenance product designed to keep nails healthy and maintain suppleness. RESCUERXX™ is for damaged, weakened nails that require treatment. Think of SOLAROIL™ as a daily conditioner and RESCUERXX™ as a deep treatment hair mask. Founded in 1979 and based in Vista, CA, CND (Creative Nail Design, Inc.) is the global leader in professional nail, hand and foot beauty – including CND SHELLAC® brand 14+ day nail color. Deeply committed to advancing the nail care industry, CND devotes significant time and resources to product research and development, education and customer support. CND is an industry-leading advocate for the role of nail care in personal beauty and fashion. **These products were provided to me by RPR Marketing at no charge. All opinions are my own and I have not been compensated in any way. Next postZoya press release, Name a New Zoya Color!